Vile Monarch has announced the release date for Crush Your Enemies’ Nintendo Switch version. The game will be out via Nintendo eShop on August 2, 2018 in the west. Calling all barbarians: Crush Your Enemies, the downright barbaric RTS from Vile Monarch, is launching on Nintendo Switch on August 2, 2018. Get ready to launch hilarious and deadly plans of attack in this retro strategy title from the comfort of home, the bus, the cabin, or just about anywhere you can think of. 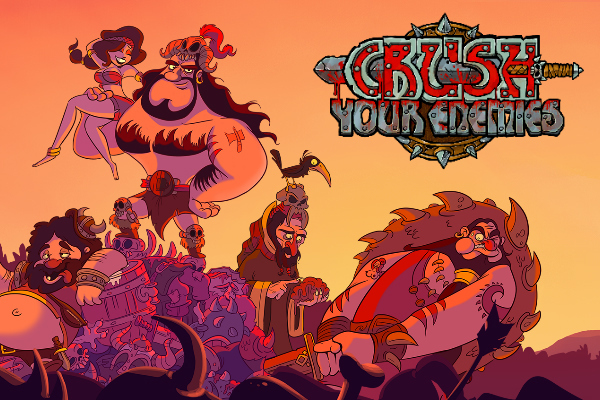 Crush Your Enemies recalls the awesome strategy games of olde while doing away with longwinded, hour-long skirmishes. Choose your units, manage resources, take enemy territory, and outwit your oaf-like opponents in exciting, fast-paced matches. Amidst the action, each level is packed with a variety of deep strategic options for you to explore and exploit in true barbaric fashion. Online and local multiplayer: Play against your friends and loved ones. The battle never has to end! Story filled with Naughty Humour: So your momma won’t mistake the game for her favourite Medieval Village Clickfest!